Another potential "Who Goes There?" subject gone. The wonderfully named Cono and Sons O'Pescatore Restaurant in Williamsburg has closed its doors after 26 years. It's funny. A couple months back, I was choosing my next "Who Goes There?" destination and was torn between Cono and Frost Restaurant. I chose Frost. Wrong decision. Frost is still there. 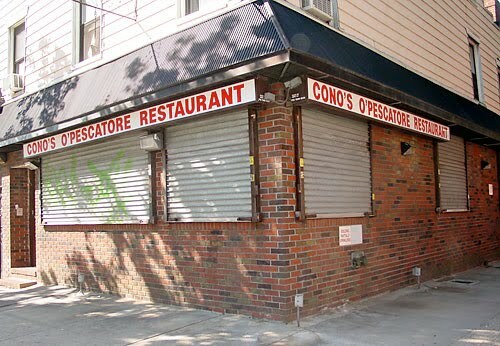 Cono is gone for good, and so is my chance to record a dinner there. The place shuttered after its owner Cono Natale decided to retire. It was a favorite of Democratic pols. Even Hilary Clinton ate there. All to chow down with local leader, Assemblyman Vito Lopez. 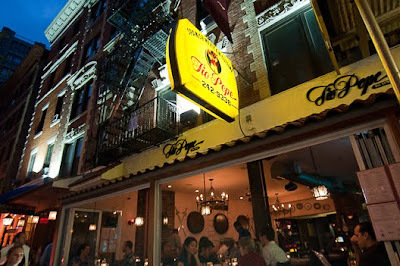 According to the Brooklyn Paper, the place was known for calamari, veal and fresh fish dishes. 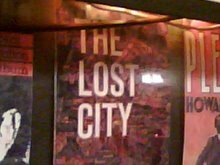 Lost City Asks "Who Goes Marco Polo?" I'm getting quite lazy about re-posting these "Who Goes There?" column on the site. This one appeared on Eater a week ago. Old Marco Polo. Not that old, really. 27 years. But seems old. Certainly takes its cues from every other red sauce joint that used to line the streets of South Brooklyn. Strange, and sad, timing on this one. The first time I ever went to Marco Polo, in 1994, was with my mother-in-law. It was her kind of place. She passed away earlier this month at the age of 85. In subconscious memory of her, I took my son to eat at Marco Polo a few days later. 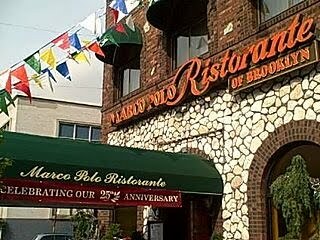 Marco Polo Ristorante was founded in 1983, at which point most of the residents of Carroll Gardens had probably never seen a Yuppie. Today, long after the hipster horde has descended on the Brooklyn neighborhood, the eatery stands as a stolid reminder of the area's still-strong Italian-American roots. A block west from Smith Street's restaurant row—and wholly unconcerned with that high-falutin' noise—it is housed in a boxy brick building with a formal green awning. 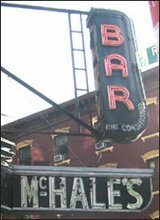 Though only two stories tall, it seems to dwarf everything in sight, and is certainly big enough to house all the ghosts of Carroll Gardens Red Sauce Joints Past. Lost City Asks "Who Goes Tio Pepe?" The commenters on Eater didn't have much good to say about this stubborn Village joint. Guess I've been spoiling them with joints like Sardi's and Frost and Wo Hop. Never said these places are all good. Only said they are survivors, mysterious survivors. The thick-haired manager of Tio Pepe, the Spanish-Mexican place on W. 4th Street in Greenwich Village, all but drags customers into his restaurant, leaping to the sidewalk whenever he sees a couple showing interest in the menu posted outside. But he doesn't really need to do much cajoling. A great many are more than happy to enter the small, but deep, restaurant, with its cheesy Iberian-flavored decor (barrels half-buried in the wall, cast-iron chandeliers). Some are tourists wandering the Village. Some are locals who have gotten used to Tio Pepe always being there. Many, however, are Spanish and Mexican visitors who somehow know about the place and begin an all-Spanish dialogue with the manager and waiters the moment they walk in. "This is Greenwich Village," said one waiter about the surprisingly international crowd. "Everyone comes by here."